Glyph Bio - Though most urbanites prefer to use an elevator or perhaps a staircase, the oft-overlooked rope provides a handy means of ascending or descending a building. It is exceptionally useful for anyone trying to avoid the crowd, or just get some fresh air en route to their preferred elevation. The Bat-Rope can be used more effectively by Valiant Crime Fighters. Instead of moving this figure normally, you may choose a small or medium friendly figure that is adjacent to this figure, and then you may move this figure one space up to 40 levels up or down. After moving with this special power, if you chose a figure, you may place it on an empty space adjacent to this figure. Figures moved with this special power will not take any leaving engagement attacks. After using this special power, if this figure is a Valiant Crime Fighter, it may use this special power one additional time. Having a hard time figuring out art here - probably any coil of rope could do in a pinch, but I was hoping for a decent shot of the one from the show that had a little bat-shaped hook at the end. So does the one extra turn have to be this turn or does it work more like you get two shots through out the game of you are a valiant hero. I believe it's intended to be an immediate additional use. Cards up now. I found a nice batarang to use. 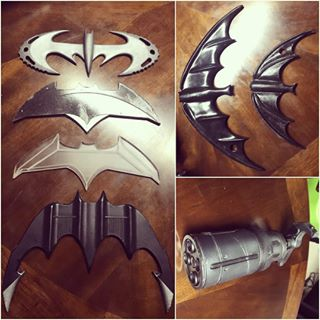 My suggestion is to flip the batarang upside down and connect the rope at the tail of the bat. In practical use, the wings of the bat act as grappling hooks, which would never work if the rope is off center. I do like the sound of that. Any chance you could give it a shot, Scapey? Let's send the Bat-Rope On Deck.